Specialised infant formulae subsidised on the pharmaceutical schedule, i.e. partially or extensively hydrolysed formula, amino-acid formula, are only appropriate for infants with cows’ milk protein allergy who are unable to be breast fed. Cows’ milk protein allergy (CMPA) is an immunologically mediated adverse reaction to cows’ milk protein, with a prevalence of approximately 2% in infants aged under two years. Allergic reaction to cows’ milk protein can be IgE or non-IgE mediated, and the spectrum of reactions ranges from immediate anaphylaxis and food allergy reactions to delayed effects such as atopic eczema. Diagnosis can be challenging, and it is generally recommended that children with suspected CMPA are referred to a paediatrician for assessment. In New Zealand, more expensive and last-line amino-acid formula products, e.g. Elecare; Neocate; Vivonex, are being prescribed as an early option. Pharmaceutical dispensing data indicates that many infants with CMPA are prescribed an amino acid formula without an initial trial of an extensively hydrolysed formula (or soy if the infant is aged more than six months). The use of amino acid formula as an early option is inconsistent with international guidelines, which suggest that only around 5–10% of infants with CMPA require an amino acid formula. As amino acid formula is also significantly more expensive than other options (approximately five to six times the cost of extensively hydrolysed formula per 100 mL), the continuing high uptake of amino acid formula in New Zealand is unsustainable. The age of an infant and the clinical characteristics of the CMPA should determine the type of infant formula most appropriate as an initial option. If CMPA is likely, an elimination challenge can be initiated. Cows’ milk should first be eliminated from the mother’s diet in infants who are breastfed. If this is not possible, or for infants who are not breastfed, the first-line choice of formula is extensively hydrolysed formula, e.g. Pepti-Junior. Soy formula can be trialled in infants aged over six months as an alternative first-line option. Some infants with significant gastrointestinal symptoms that do not improve after this trial may benefit from a further trial using amino acid-based formula. These recommendations are summarised in Table 1 below. If none of these formulae are tolerated, an elemental feed may be trialled; these would be the most costly option, however. Other formulas such as goats’-milk based, lactose-free and partially hydrolysed formula are not suitable for infants with CMPA. Regular re-challenge is recommended to avoid continuing with an unnecessarily restrictive diet. The optimal interval for re-challenge is dependent on several factors including age, severity of symptoms and evidence of an immunological reaction to CMPA. Kemp AS, Hill D, Allen K, et al. 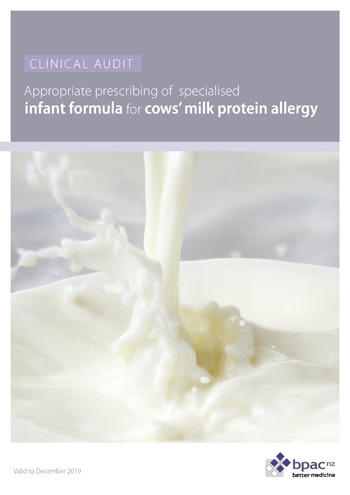 Guidelines for the use of infant formulas to treat cows’ milk protein allergy; An Australian consensus panel opinion. Med J Aust 2008;188(2):109–112. Koletzko S, Niggemann B, Arato A et al. Diagnostic approach and management of cow’s-milk protein allergy in infants and children: ESPGHAN GI committee practical guidelines. JPGN 2012;55:221-9. A recommended standard would be for 90% of infants prescribed amino acid formula to have a valid indication for receiving this formula, if appropriate have previously tried extensively hydrolysed formula and re-challenge attempted or planned. There should ideally be an improvement in the achieved percentage between the first and second audit cycles. Any infant that has been prescribed amino acid formula. You will need to have a system in place that allows you to identify eligible patients. Many practices will be able to identify patients by running a ‘query’ through their PMS system. We suggest you identify all infants who have had a prescription for amino acid infant formula in the previous 12 months. The number of eligible patients will vary according to your practice demographic. It is unlikely that a large number of results will be returned, but if so, take a random sample of 20 – 30 patients whose notes you will audit. Use the data sheets provided to record your first and second cycles. In each data set, calculate the number of “positives” by dividing the total number of infants prescribed amino acid formula by the number of “Yes” results in the final column. The recording of the indication should be used to help evaluate future practice and identify any areas of infant formula prescription or re-challenging that could be improved within the practice. It is recommended that the second cycle be completed within 12 months of completing the first cycle. The second cycle should begin at the data collection stage. Following the completion of the second cycle it is recommended that practitioners complete the remainder of the summary sheet. Expert guidelines recommend regular monitoring of growth for children with food allergy in combination with nutrition counselling. There are, however, no clear guidelines on when re-evaluation of CMPA or other allergies should occur. In practice re-trialling allergenic foods depends on clinical judgement, taking into consideration the severity of symptoms, the age of the child and other medical and social circumstances. For infants with anaphylaxis, food challenges should be performed in hospital.